Home > RC Hobby > Motor Battery Packs > N1900SCRMP : SANYO 1900mAh FAST CHARGE Ni-Cd motor battery pack. Choose Voltage, Shape, & Connector. N1900SCRMP : SANYO 1900mAh FAST CHARGE Ni-Cd motor battery pack. Choose Voltage, Shape, & Connector. SANYO 1900mAh "N-1900SCR" Sub-C Ni-Cd battery pack for electric motors. Cells are 0.910" dia. x 1.69" tall. Each cell weighs 1.96 oz. These are heavy-duty high-Discharge cells! They can be Fast-charged or Slow-charged. Choose pack Voltage, pack Shape, & Wire Leads or a Connector from the scroll-down menus. Pricing starts at $39.00, and reflects options chosen. 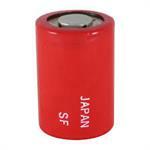 These battery packs are made to order, and are made by US right here in the USA. Lead time is 1-2 days. N700AACMP: 700mAh battery packs for RC electric motor toys. Made with "N-700AAC" AA-size Ni-Cd cells (cell is 2" tall x 0.56" diameter). Each cell weighs 0.77 oz. Choose pack Voltage, pack Shape, & Wire Leads or a Connector from the scroll-down menus. Value-priced 7.2 volt 1800mAh rechargeable Ni-Cd pack for Electric Models. Twin-Stick (B) shape. Includes TAMIYA connector. These battery packs are manufactured by BATTERIES AMERICA in the U.S.A.
T2/3A700MP (UPGRADE): 700mAh Ni-Cd battery packs for electric motors. Cell size is 2/3A (0.67" dia. x 1.1" tall); cell weighs 0.63 oz. Choose pack Voltage, Shape, & Wire Leads or Conn. from the scroll-down menus. 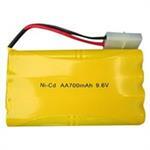 8.4 volt 1800mAh rechargeable Ni-Cd battery for RC models & toys. Twin-Stick (B) shape, with the extra cell across bottom. Includes TAMIYA connector. These battery packs are manufactured by BATTERIES AMERICA in the U.S.A.
7.2 volt 2000mAh High Power rechargeable Ni-Cd battery pack. Includes Tamiya connector. For RC sport hobby use, Airsoft guns, etc. KR1800SCEMP: rechargeable NiCd Sub-C battery packs for RC electric motor. Choose shape and connector. These battery packsare MADE IN THE USA. 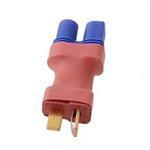 Pricing starts at $33.50 (7.2v, with wire lead). SANYO 1900mAh Sub-C Ni-Cd battery pack for electric motors. Cells are 0.910" dia. x 1.69" tall. Each cell weighs 1.96 oz. Heavy-duty high-Discharge cells! They can be Fast-charged or Slow-charged. Choose pack Voltage, pack Shape, & Connector from menu. NC-2500SCRMP: Ni-Cd motor battery packs, made with new SANYO-Panasonic NC-2500SCR Sub-C high-power rechargeable Ni-Cd cells. Choose voltage, Shape, & Wire Leads or a Connector from the scroll-down menus. Pricing reflects options chosen.